Told you some new small paintings would appear!!! 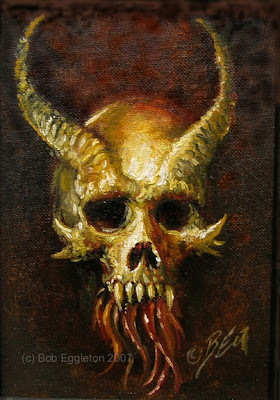 Since we're on the cusp of Halloween season, here's some creepy images as small, 6x8 paintings. Both have sold over in England at Brian Lumley's small convention we attended this last week or so. What a great time. 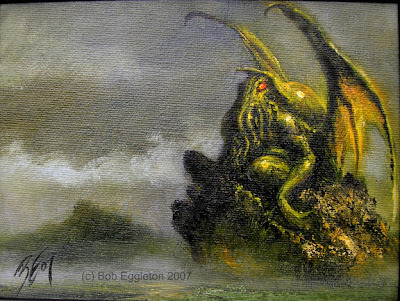 The above painting is a study done for an upcoming cover with Cthulhu on it. Both done in oils and rather fast...lots of fun. Expect more Halloween season paintings this coming October! So I'm back from England. A VERY successful trip indeed. Lots of photos of the south of England and, the coast, which is pretty amazing, really soon!!! 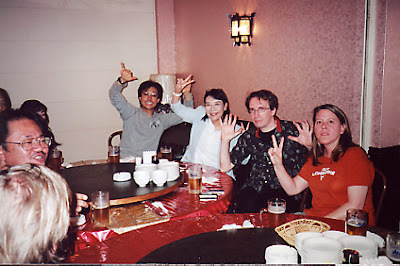 A group of us at a Chinese restaurant, in Yokohama, run by one of the Iron Chef guys(no kidding!). The top shot has me, John Davis, his wife Kim and good friend Trey-all people we were travelling with for a time. We're really hungry too. Kim and I are sporting Gama-Go T Shirts, which are these cool west coast shirts designed by Tim Biskcup. Below shot, is the other end of the room, mostly Japanese friends. I was teaching them how to say "Art du Jour" and what it meant. 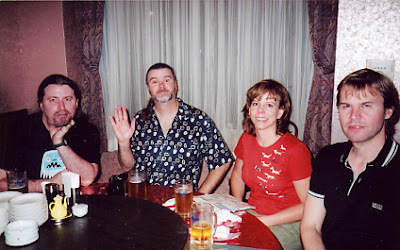 To the right of this shot is Hiroko Sakurai, Norman England and Kim's sister Paige who claims she "became a superstar at parties by saying I am travelling with Bob Eggleton". What parties were those? I'd like to know! 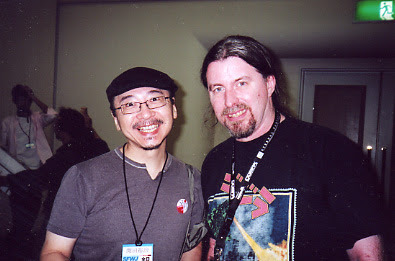 This smiling man on the left s Yuji Kaida, only one of Japan's finest SF artists, and specializes lately in Godzilla and Kaiju art for toys, packaging and so on. Met him in 2002, and we've known each other ever since. symbolic as ferris wheels come right back to where they started. Kaiju Shonen!! 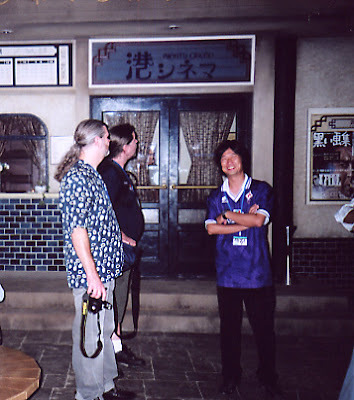 Left to right John Davis, filmmaker, Shinichi Wakasa, monster suit maker, and me, art maker! 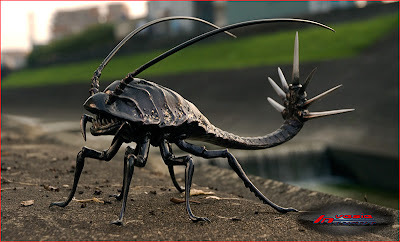 We created a term about five years ago called "Kaiju Shonen" meaning "Monster Kids", so all emails have to be signed "Kaiju Shonen" in some fashion when we talk. It's a great friendship that stands distance and time. One of those things you realize you have something really good in life. So we're at the end of Japan on Art Du Jour. Next is England, and lots of new paintings, and art to come. Stay tuned. 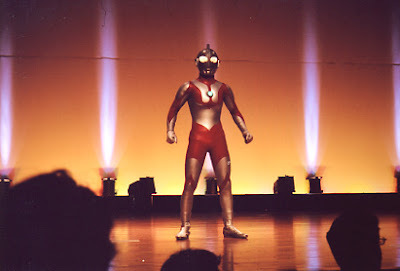 ULTRAMAN and his Ultra Brothers gave a spectacular show at the Hugos. Again, I lived to see the day that in front of a high-end SF audience, giant monsters battled superheroes from outer space. SEE? I was onto something wasn't I? All courtesy of Tsuburaya Company. I have been to one of these shows before and, they are performed regularly in Japan by super pro stunt actors. 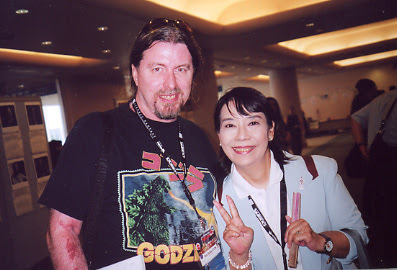 And this is Hiroko Sakurai who has been a friend now for about seven years. She played, in her very young days, Agent Fuji of Science Patrol, who worked with Hayata-Ultraman's alter ego on earth. Sakurai-san is perhaps one of the most gracious people I know. You watch this show in the 1970's and then, 30 years later you are having dinner with it's stars. Life is a good thing. 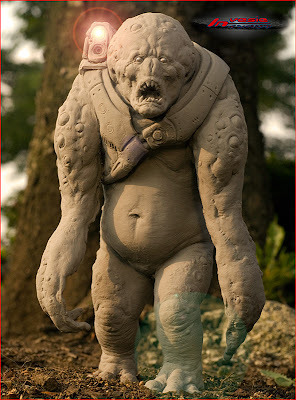 Me as Pigmon-a small, but cute monster from the Ultraman series. 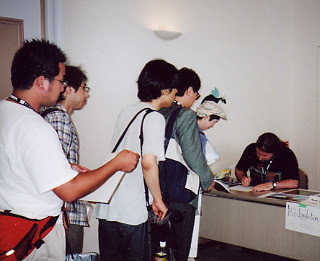 Part of my autograph line at Nippon 07. EVERYONE wanted a Godzilla or a dragon drawn on one of these calligraphy boards they had with them. It had to be at least 40 people I did drawings for! My hand was killing me! But I did them all. Takumi Shibano-what more can be said about this man-Japanese editor,translator and teacher, who's showing some age, and has health issues, but he's still got the sparkle in his heart. He pulled me aside and we had a delightful conversation which I was happy we did. He was no less the Japanese Fan GoH, as he should be!!! Some Kaiju Friends!! 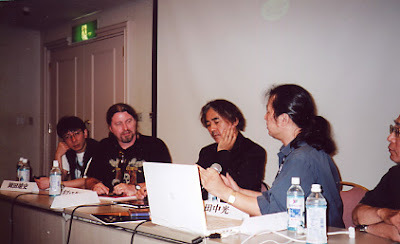 Left is Shinichi Wakasa-#1 Monster Suit builder, Yuji Kaida-fellow Godzilla and monster artist, Yours Truly and, Writer/Director/Filmmaker(THE iDOL) Norman England. I'll probably have one more post about my Japanese adventures, and then I move on." At last!" you're saying. Well, I hope you have enjoyed this vicarious adventure as much as I have enjoyed showing you. It's off to the UK on Wednesday for Brian Lumley's small but fun convention in the south of England. And yes, pix from that will be blogged. Not to worry, I'll get back to the art. The purpose of these sharing of adventures is to show you how I tick and what inspires me to paint in the first place. 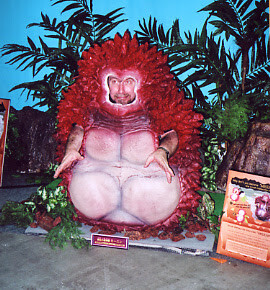 Me at the entrance to the show. Here's some shots we took at the MOT-basically the Modern Art Museum of Tokyo. A huge exhibit was on the art of Kazuo Oga. If you have seen and love(as I do) any of the films by Hayao Miyazaki like TOTORO, SPIRITED AWAY, HOWL'S MOVING CASTLE, LAPUTA, et al, then you have seen his art. He is the background/matte painter and has been involved in all of Miyazaki's films painting-in sometimes as little as 20 minutes(! )-background painting that are lush, deep and amazing. 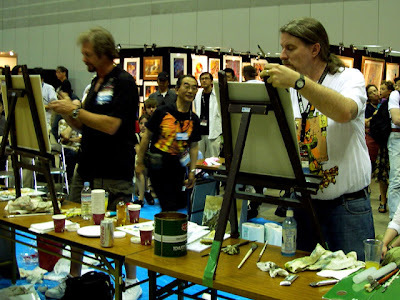 He's also worked on alot of anime films in the 1980's, one being HARMAGEDDON and, he's done some picture books, and illustrations for poetry by survivors of the Hiroshima A-bomb in 1945. We bought all the books, and the Hiroshima one was so heartwrenching it's hard to read without getting tears in one's eyes. But, to see Oga's work, all you need to do is rent or buy any of Miyazaki's amazing films. It was a real treat to go here and again, I thank Ikkie and Shoji Hasegawa and Hicaru Tanaka for all their generosity in time and effort. JAPAN BLOG: Think Like Amano!!! 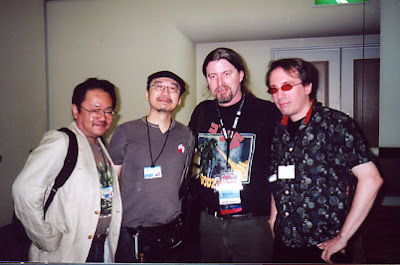 Meanwhile back at The Worldcon, I had the honor, and, personal dream to meet the legendary Yoshitaka Amano. 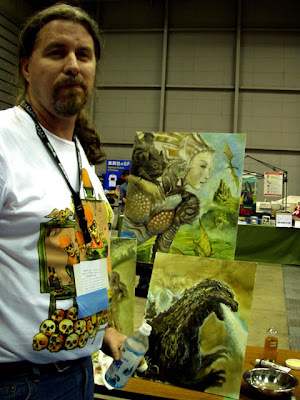 His work is beyond words, and he's perhaps the most successful Japanese fantasy artist ever. 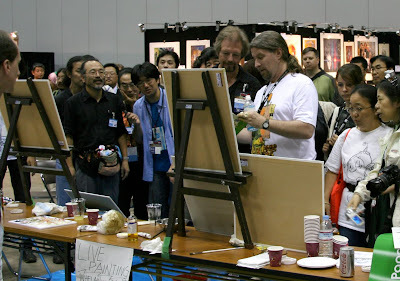 Pictured here is the panel "Yoshitaka Amano vs Bob Eggleton". We just called it that because "vs" is a cool term these days. 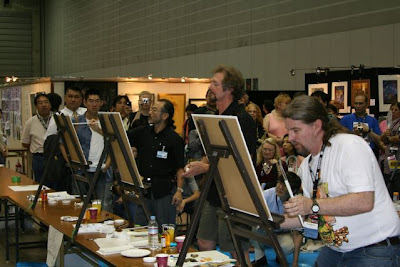 We discussed art, and technique..and it was done in Japanese and English and thanks to Okada-san(far left of me) and Tanaka-san and Kawai-san(on the right seated of Amano) it all came off pretty awesome. 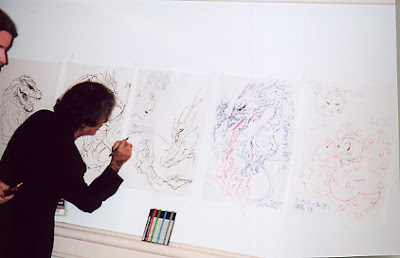 While it started off a little...terse...mainly due to language barriers and translations, drawing was the spoken word for all artists-Amano wanted to tape up some paper and "We will do drawings together". A collaboration with Amano? I have lived to see the day that I achieved yet another dream. You can see we pretty much had the same thinking going on. 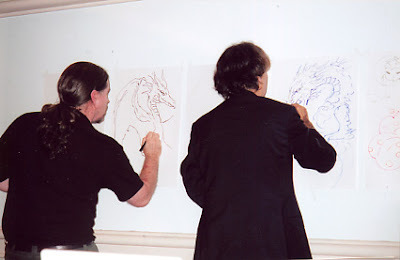 Amano's plan was to draw on one side and I draw on the other and we meet for the final "confrontation" in the middle. Watching this man work is amazing. 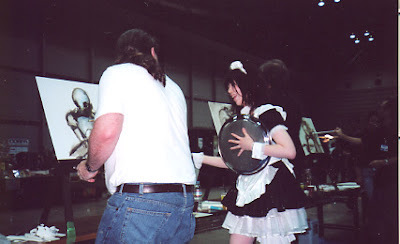 In the end, the drawings were given away "Rock-Paper-Scissors" style auction. You had to see it to believe it, it went from an intense, solid discussion on art and thinking and techniques in which you could hear a pin drop...to a party atmosphere. Only in Japan, as I always say. 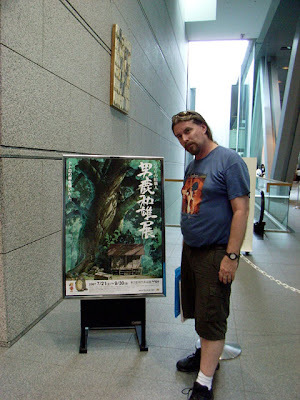 This is me in the lower reception area of Amano's Rappongi studio. Yes, stainless steel blinds. 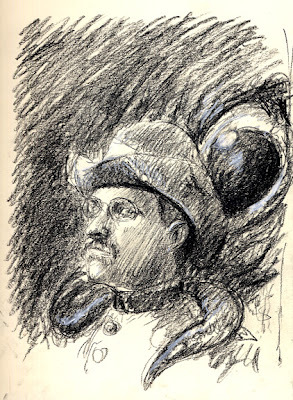 And some of his new work done in a verso technique. His "upper working studio" is off limits to cameras but it's pretty amazing. And his private working studio(third floor) is off limits to all eyes but Amano! I feel the same way some days about my own place. 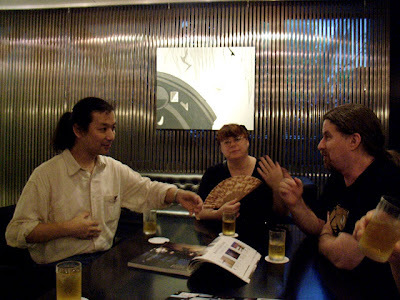 Hicaru Tanaka(left) and I discuss Amano's work. My wife Marianne looks on. We owe a debt of gratitude to Amano's studio manager, Mariko Suzuki and , Shoji and Ikkie Hasegawa for this rare opportunity. JAPAN BLOG: Just what is INVASIA??? I think this will be spectacular if it gets going, and somehow I know it will. Okay. Let's pause for a painting...and my Birthday! 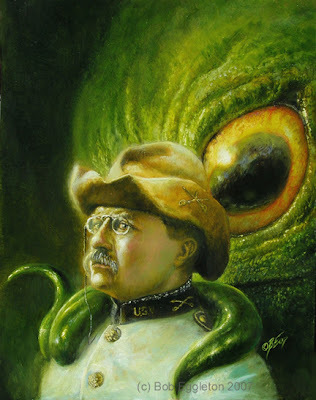 Okay, a pause from Japan just to show in all my jetlagged week, I still managed to start and finish a cover painting for a new Mike Resnick book called ALTERNATIVE ROOSEVELTS which has ol' Teddy getting himself into all kinds of alternate universe adventures, including with H.G. Well's martians. 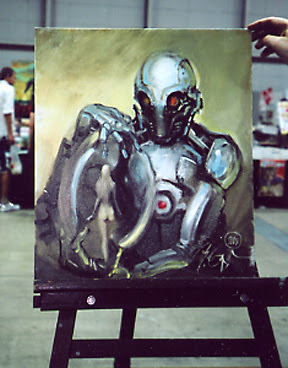 I posted the sketch some time ago last month and, in oils, I did the finished art, above. I really like doing portraits which is a fact not many people know. I love how this came out, just like the "old photo" feel I wanted. Anyway, more Japan pix to come because I have so much to show. Here's the finished painting started by me(mostly the robot head, you can see me starting in the bottom pic) and finished by Whelan. Looks great! I LOVE how Michael put the girl in the glass container into it. What a story! 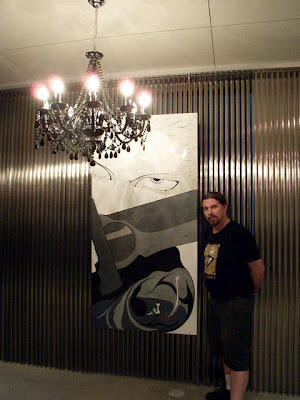 The painting was bought by John Davis as well!! Nice when all your friends are involved. We were pretty worn out at this point but here's me(left) and Whelan(right) after a long time with messy, paint covered hands and, alot of joy and fun on the canvases. The convention made sure we were "well serviced" with drinks when we needed, as even with AC the exhibit hall was very humid. I LIKE their idea of "gal-in-maid outfit service" for artists. Okay, this is the new facade for Toho Studios. A bronze Godzilla part of a sculpture. I have 2,789 Godzillas in my home. I had to leave this one behind. A huge,60 ft mural for the entry way to Toho. 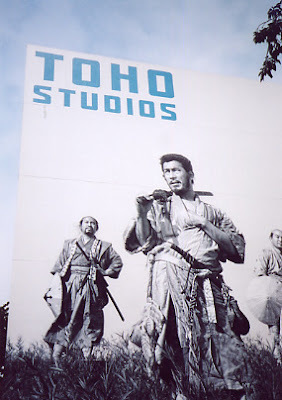 This is a painting of a scene from THE SEVEN SAMURAI, filmed at Toho by Kurosawa many years ago. John A Davis, director of THE ANT BULLY and JIMMY NEUTRON with me, and we're having a fanboy moment conferring with Yohei Taneda, the production designer of Toho's new production, MAGIC HOUR. 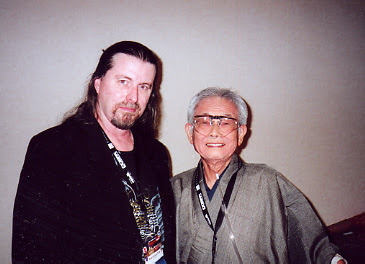 He was also the prod designer for the Japanese segment of KILL BILL VOLUME 1, one of my very favorite films. How cool is that? Two cool dudes, a giant monster in the 95 F heat. 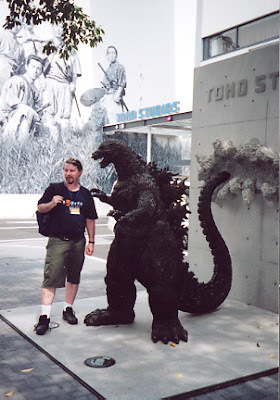 John A Davis(right,me left, and Godzilla, center. He actually looks like he's standing there. Don't you love the tail ripping the cement? 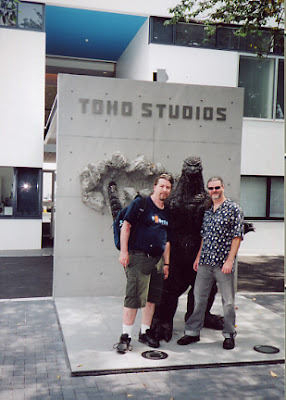 With monster suit maker Shinichi Wakasa, John A. Davis, myself and our wives, families and friends got a very special tour of Toho Studios(that does not do "tours") to see what was going on and their new facilities, by Toho President Shogo Tomiyama. Pretty cool. Some business was even discussed with Tomiyama but more on that as it develops. 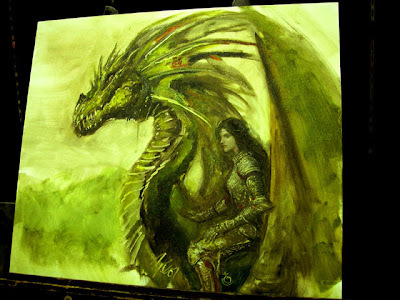 More pix of the art painting demo later, just an interlude to show you other stuff we did!!! 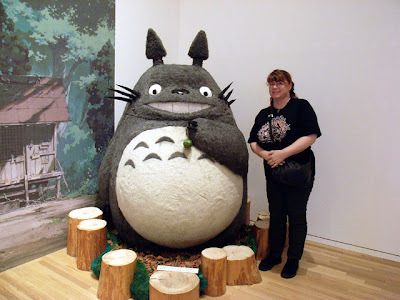 JAPAN BLOG: Turning Japanese, I really think so!!! 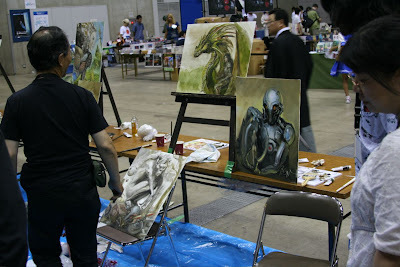 MORE FROM JAPAN-the LIVE painting! The above painting sold for $16,000-done by Kato and Me. Kato's figure(I started it) is tremendous and has to be seen in person. Sales of the paintings went for benefit, none of us made anything off it save for some good Karma! 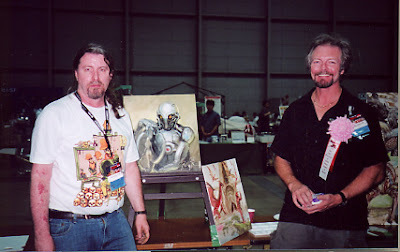 Michael Whelan(left) and me(right). Japanese art enthusiast and, friend to both Whelan and me, Yasuo Kawai beams on. It's thanks largely to him and Hicaru Tanaka this whole thing came off. 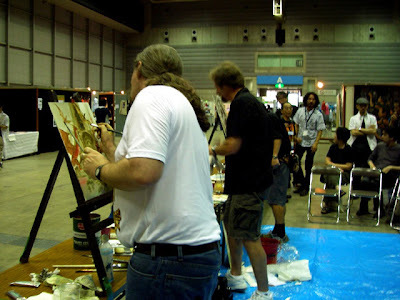 Here's me-looking a tad fat, working on Kato's painting which, Whelan had just finished with! Our knees were killing us after four hours!!!! Don't worry!!!! 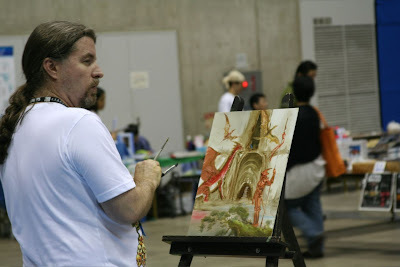 Lots more photos to come of the Worldcon, Japan, Amano and so on all week! If I showed everyone everything at once....then what fun would that be? 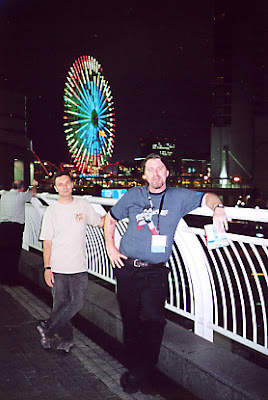 All these photos courtesy of Ikkie Hasegawa, with her husband Shoji, two of my very best friends in Japan. Thanks Ikkie!!!! 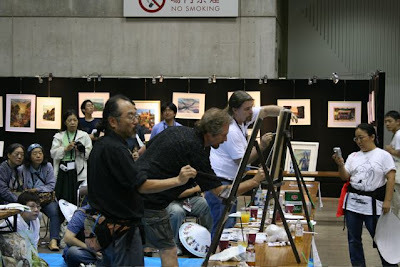 Here's some pictures, courtesy Michael Whelan of the big painting jam that was held in Yokohama at the 65th World SF Con. 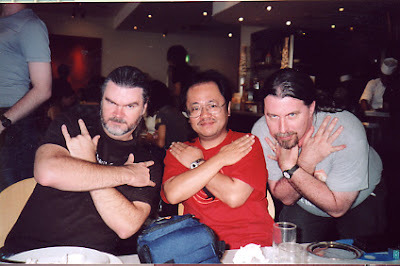 Pictured are Naoyuki Kato-*the* premier Japanese SF illustrator, Nippon US Artist GoH Michael Whelan and, me. I'm really massively jetlagged, so more pix and thoughts soon, only to say this was an amazing, and fantastic experience bringing all our talents into a series of paintings that wowed the crowds. Lots more soon as I cover some of the art I did with friends at the World SF Con. As to blog paintings, all the ones you saw earlier, as marked for sale at Nippon, sold outright, with Godzilla 1954 selling for a whopping $1200. in an auction, to a Japanese buyer. No higher compliment than that! !